GRAFENWOEHR, Germany — It’s not uncommon in this part of Germany to spot a deer at dusk or dawn. And if you hit one with your automobile either on- or off-post, there are certain steps you should take. 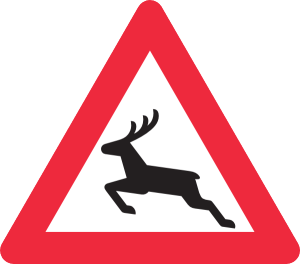 Vehicles collide with wild animals on a German roads over one million times a year, which has resulted in as many as 200,000 vehicular accidents a year in Germany, according to a 2013 report by Der Spiegel. The problem has become so bad in Germany that organizations have begun pouring resources and research into preventing collisions — even so far as building bridges intended to make it easier for animals to safely cross roads. Deer are typically nocturnal and you’re most likely to see one between 5 – 7 a.m. and again between 8 – 10 p.m. If you see one while driving, honk your horn to scare them off. What kind of deer are common here? The Bavaria Military Community in Grafenwoehr, Vilseck and Hohenfels is situated in the Oberpfalz (also known as the Upper Palatinate), one of seven administrative regions in the state of Bavaria. According to the USAG Bavaria Environmental Division, there are two types of deer in this part of Germany: Red deer(Rothirch) and Roe deer(Rehbock). If I hit a deer with my car, can I take it home and eat it? You should not take the deer home after you hit it, according to the Environmental Division. According to the German Hunting Association (DJV), it is considered poaching to take the dead deer home after you hit it. Therefore, when you call the police after hitting the deer, they will contact an assigned hunter in that area to take care it. What should I do if I hit a deer with my automobile? If you hit a deer on-post, move the car to the side of the road, put up a warning triangle (required in all POVs while stationed in Germany) and call the military police. They will contact the Forest Office. Move the car to the side of the road if possible. Do not leave the scene. Put up a warning triangle. Call the German police at 110 and let them know what happened. If a person gets injured call the hospital emergency line as well. When the police arrive, fill out an accident report for your insurance. Use your mobile phone and take a few snap shots. This will help you with your insurance claim. Once the police get there they will notify the hunter that is in charge of that area and will take care of the deer. File a claim with your insurance company, it depends on your insurance whether you are covered or not and which steps to take. You should never wait until the next day to call the police, according to ADAC, the German auto club that provides roadside assistance and air rescue. Your insurance will likely only cover your damage if you contact the police right away. Bavaria, drive safe. Remember, there is a possibility that deer will cross the road, especially at dusk and dawn.